Granny lets Bugs Bunny come in from the cold, but her dog Sylvester will have none of it. 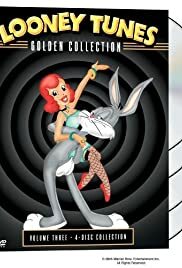 Bugs Bunny relates his early life in the Manhattan tenements and spotlights his encounter with a gang of canine toughs. Elmer Fudd walks out of a typical Bugs cartoon, so Bugs gets back at him by disturbing Elmer's sleep using "nightmare paint." When the circus arrives they put the lion's cage right over Bugs' rabbit hole. While vacationing in the Ozark Mountains, Bugs Bunny encounters Curt and Pumpkinhead Martin, two dimwitted hillbillies who are duped by Bugs into a violent square dance. Humphrey Bogart visits the Mocrumbo Restaurant. He orders fried rabbit and Elmer Fudd has twenty minutes to serve it. Elmer Fudd: [Elmer is seen dripping chemicals into a test tube] I'm trying to make the formula that will change a normal character into a deviwish fiend. Q: Is this cartoon available on DVD? What's up, Elmer the doc? Elmer Fudd is a mad scientist this time.He wants to use his "Jekyll and Hyde" potion but keeps failing with test animals.This potion would turn its victims into monsters.Elmer goes out to catch Bugs Bunny with his old fashioned rabbit trap.Bugs decides to humor him.Then a bear enters the lab and Elmer thinks the potion has worked and the bear is actually Bugs.Later Bugs mistakes the bear for Elmer.Hare Remover from 1946 is the last cartoon Frank Tashlin directed at Warner Bros.Mel Blanc sounds as good as Bugs Bunny as he always did.Same thing with Arthur Q. Bryan as Elmer Fudd.This Bugs Bunny has its moments, even though they did come up with better.But there are Bugs' famous quips, one being "I think Spencer Tracy did it much better.Don't you, folks?"